The best part of haunted houses and amusement park rides is getting to see pictures of your friends screaming in terror. To get these kinds of pictures requires perfect timing. The best way to get this is with an electronic control circuit. So in this project, I am going to show you how to make a simple automatic camera shutter switch. The best way to set this up depends largely on what kind of camera you have. So I am going to cover a variety of methods that you can use with different cameras. For example, a Canon EOS Rebel T3i uses a 2.5mm stereo plug (3/32" can also work). As shown in the picture, the sleeve is connected to ground. The center ring activates the focus function. The tip activates the shutter. To activate the focus and the shuttle, you just need to connect that pin to ground (the sleeve). You can do this with either a mechanical button or an electrical circuit. If your camera does not have a built-in shutter switch terminal, it may still be possible to control it with an electrical circuit. But it will require you to do some internal surgery on your camera. First remove all the screws from your camera and remove the outer housing. Keep in mind that there may be screws hidden behind stickers. Locate the camera's shutter switch. This will typically have one terminal that connects to ground to activate the focus and one terminal that connects to ground to activate the shutter. Most cameras will auto focus when you activate the shutter. If this is the case, you only need to make a connection to the shutter terminal. Solder one wire to the shutter terminal and one wire to the ground terminal. Touch the two wires together. If all the connections are made properly, this should activate the camera's shutter. Now you can activate the shutter with an external circuit. All you need to do is connect the ground wire from the camera to the ground of the circuit. Then have your circuit connect the shutter terminal to the common ground. The easiest way to do this is with a simple momentary switch or a transistor. With some circuits you can activate the shutter by outputting a LOW signal to the camera's shutter terminal. If your camera does not have a built-in shutter switch terminal and it is not possible to add a connection to the shutter switch as detailed in step 2, then you still have the option of mounting an actuator onto the camera that can mechanically press the button for you. This will still let you automatically control the camera. It just requires the addition of a motor and a motor controller circuit. One method is to use a servo to press the button. The servo is mounted immediately next to the shutter button. When the servo turns, the arm (sometimes called the horn) presses the button. It is also possible to use a regular motor. Just mount it above the shutter switch. Then attach a bracket to the shaft that is capable of pressing the button. You can use something as simple as an offset circle. This method works best for taking pictures at regular intervals such as with a time lapse setup. The simplest way to activate the shutter is with a momentary switch. This is very commonly used in photography. But it can also be an easy way to automatically take a picture of something. For instance, the switch could be a pressure plate switch. It could be an open door or window sensor. It could be a limit switch. You could even use a trip wire. You can use any kind of momentary switch and there is no limit to the number of ways that you can set it up. Just use your imagination. The best way to automatically control a camera is with a microcontroller such as an Arduino. To connect the microcontroller to your camera, you will also need are a small diode and a jumper wire. Insert the cathode of the diode (the side with the stripe) into one of the digital pins of the microcontroller. Then insert the jumper wire into one of the GND pins on the microcontroller. Now you need to connect these to the shutter switch cable. The jumper wire should connect to the ground of the camera. The diode should connect to the shutter function on the camera. When the microcontroller sends a LOW signal to the digital pin, the camera shutter should activate. But when a HIGH signal is sent to the digital pin, the diode becomes reverse biased and prevents the electricity from flowing into the camera. This protects the circuitry of the camera from being potentially damaged. You can also use a simple 555 timer IC to activate your camera. This works great for taking pictures at a regular interval such as for a time lapse. This circuit is a little different from regular 555 timer circuits. Pin 3 is used to charge and discharge the capacitor and pin 7 is the output. I chose this layout because during the discharge cycle pin 7 is shorted to ground through an internal transistor. This is the ideal way to activate the shutter of the camera. You can power the circuit with anything from 4.5V to 18V. The timing is controlled by the resistor and the capacitor according to the formula: Time interval (secs) = 1.386 * R * C I used a 680µF capacitor and a 100k variable resistor. This let me adjust the picture interval from every few seconds to every 94 seconds. To connect it to your camera, connect the ground line to the ground on the camera. Then connect pin 7 to the shutter function. There are a lot of potential applications for an automatic camera. You can do a simple time lapse. You can use it to take pictures when you can't be near the camera such as with aerial kite photography or pole photography. You can set it up as part of a security system to take a picture when the alarm goes off. 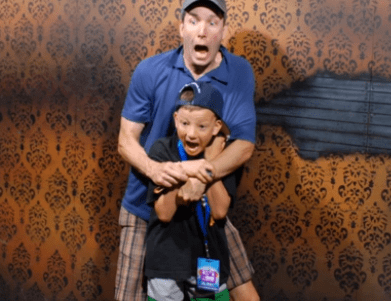 This Halloween you can set up a scare camera in your haunted house to take pictures of people being terrified by your automated special effects (Image provided by Nightmares Fear Factory Niagra Falls Canada). Use your imagination.